Wash and drain the semiya in a colander. In a pan, add oil and do the seasoning of mustard seeds, dals, asafoetida, chillies and curry leaves. Saute onion till transparent. Transfer this to the drained semiya and add salt. Mix thoroughly. Transfer this to a vessel. In a Pressure Cooker, add a cup of water and place the vessel and cook for 2 whistles. Let pressure settle. 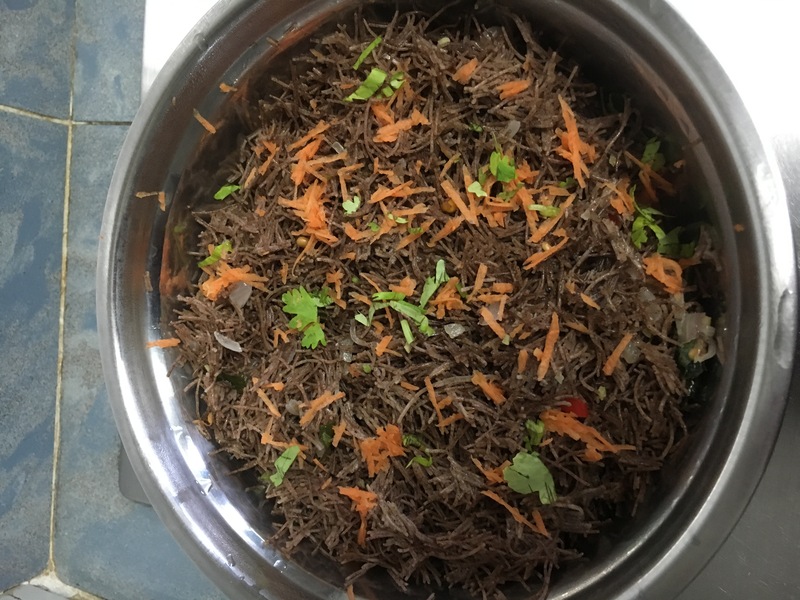 Open and garnish with carrots, pomegranate and coriander leaves. 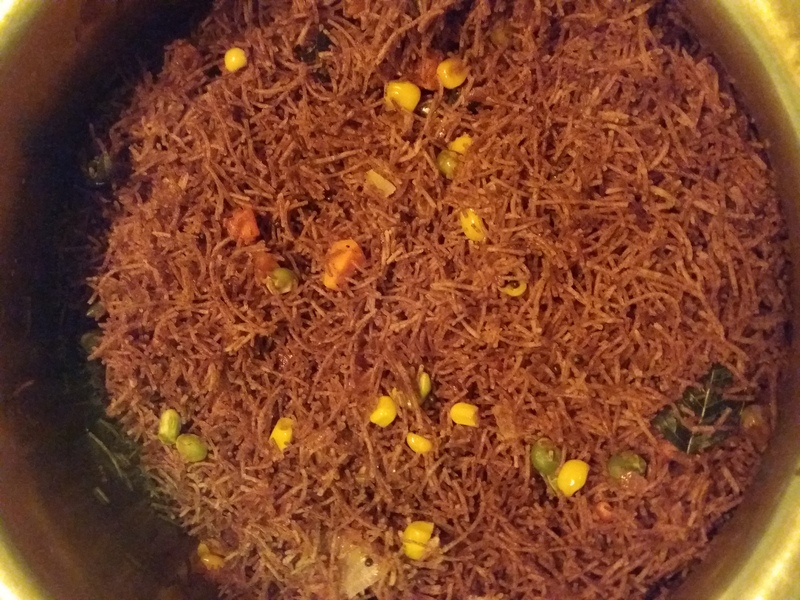 Perfectly cooked non sticky Ragi semiya upma ready. Glad to know that your umpa came out well. Thanks for sharing your experience. I tried this recipe and we loved it! I was avoiding making ragi semiya cos of the time and steps that’s involved in traditional method.. This was too quick and udhir udhir too ???? Happy to know that your upma came out udhir udhir!! Happy for you! Thanks for sharing your experience. I tried this recipe and it was very good. Thank you for posting healthy and easy recipes. Thanks for trying and happy to know that the upma was good. Please try other recipes and share your experience. Thanks a lot Vijaya Ma’am for the easy and tasty recipe. 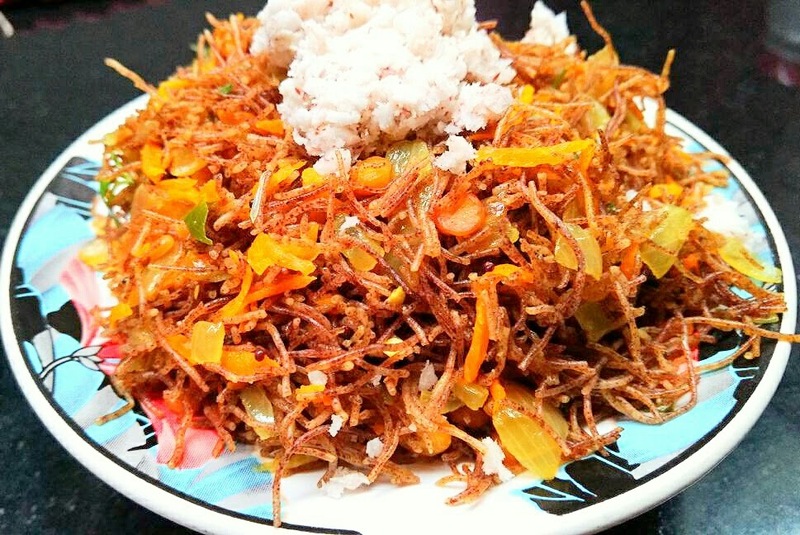 Totally impressed by the uthir uthir upma. Will make it frequently???????? Thanks for trying and validating the recipe. Your upma relayy looks udhir udhir!! Happy for you! Is it required to cook this in a 2 litre cooker or can we use a bigger cooker? Thanks for your visit. You can use a bigger cooker also.Make sure that the water in the cooker doesn’t enter the semiya vessel. I tried this recipe today and i felt the semiya was dry after two whistles.i sprinkled some water and again kept it for another whistle.still i felt it was not as moist as it should be.do you think soaking the semiya in water for a few minutes(like it says in the package) would help? Did you wash and drain the semiya before keeping in the cooker? 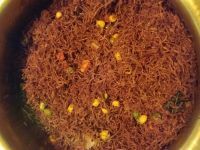 Ragi vermicelli is very delicate and doesn’t require any water to cook if we are using a pressure cooker. It gets cooked in the retained moisture after draining and pressure cooking them actually retains their shape and they come out soft and each strand will be separate. See below many validations of this recipe. i placed the ragi semiya in a colander and washed it.I felt that it could absorb more water.maybe i should wash it a little bit more?Yes i have seen so many validations of your recipes in your website as well as opos school :). 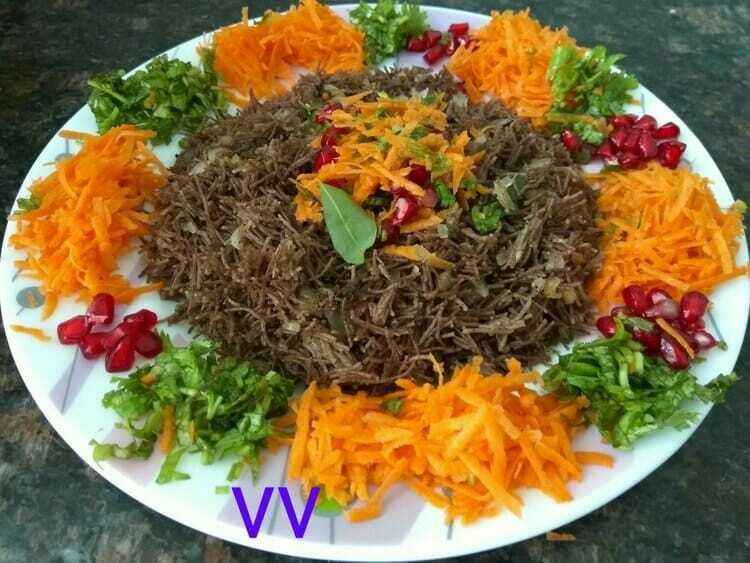 your recipes are amazing and it has helped my mom who is a diabetic to have a different view on millets.She is not reluctant to try millet recipes anymore :).Thank you! washing the ragi semiya for 30 seconds is good enough. Even rice gets cooked in 2 whistles. So semiya that too ragi semiya remaining under cooked is not at all possible. Hope you spread it out in the vessel before cooking. It helps the steam to circulate and there by helps in cooking the semiya. i should say i washed it for not more than 30 seconds under running water.i was scared that the semiya might turn mushy if i wash it more. For the qty mentioned in the recipe, 2 Ltr cooker is perfect. Thanks for trying and validating the recipe. Happy to know that your upma came out super udhir udhir!! 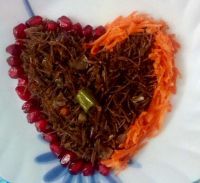 Thanks a ton VV for this awesome recipe..bye bye to mushy semiya.. welcome to pip method uthir uthir semiya..i was delighted at the sight of a perfect wholesome breakfast the texture and perfect strands of semiya..a wholesome breakfast.. pomegranate seeds and grated carrots added to the taste. Thanks for validating the recipe! Upma looks gorgeous and my heart goes out for this beautiful heart!! Yeh dil maange more!! Looks absolutely delicious!! I tried ur Ragi semia upma. Easy to do and got uthir uthir upma. Didn’t have carrots and pomagranate seeds to garnish. But still tasted good. Thanks for the easy and healthy recepies. Thanks for trying and validating the recipe. The PIP method is very helpful to get the udhir udhir texture. Your upma looks beautiful!! 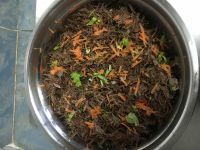 Please try other recipes and share your experience. Ragi is a type of millets that we can substitute in as many south Indian dishes . It always retains colour , flavour and texture in all the dishes. 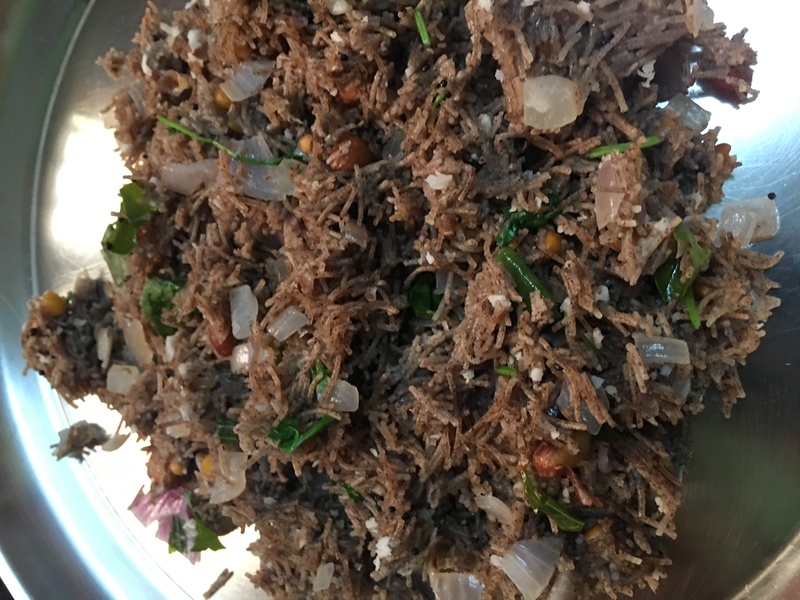 The ragi semiya has become a regular breakfast or lunch in my home as my children enjoy it in this form. Very easy and faster way to cook it this way. Thanks to Ramakrishnan sir to have introduced this method. Fully agree with you! The PIP method helps the ragi semiya to cook perfectly, but at the same time retain its shape without becoming mushy.